Inchcock – Sunday 10th February 2019: An exasperating, frustrative and disillusioning day with medical problems thrown in… All normal then! Hehe! 23:10hrs: I woke and immediately recognised that I felt in good shape physically. No dizzies, shakes, or botherations from Arthur Itis, Anne Gyna, Back-Pain-Brenda, Reflux Roger, Duodenal Donald, Hernia Harry or the Pins (legs). Kidney-Zone-Zorba was the only ache or pain this morning. Amazed I was! However; my mental cognitivity, psychologically and perhaps psychically, was a little contumacious. The thoughts were wayward and hard to organise or control, regulate, restrain or repress. Usually, after waking, the call to the Porcelain Throne would save me from such hassles, but today, the call came later than it usually would. Tsk! Out of £300 second-hand, 1968 rickety recliner. Minutes later I was saved the mental torment by a bout of Nonallergic Rhinitis (chronic sneezing), that took my mind off of my mind… if you see what I mean? The need for a wee-wee also helped. I grabbed the Emergency Grey Plastic Bucket: and what a pathetic urinalisation it was too! I spent about twenty-seconds waiting for it to start, then a couple of weak splashes, well, more like dribbles, and it was all over! But it still hurt! I had to give this mode of wee-wee a new acronym. HHPWW (Half-Hearted-Painful-Wee-wee). Hehe! Off to the kitchen to chop and put the mushrooms in the crock-pot to marinate in water with some Balsamic vinegar added to them, for later. Oh, a little tip for you all here. Always take the knife you are slicing your mushrooms with, out of your hand if your nose itches! You’re welcome! Tsk! Then, I went to start the Health Checks. For some unknown-to-me reason, it seems that last night when I was half out of it and did the checks, I’d put the sphygmomanometer back in the wrong drawer? Hey-ho! I found it eventually. Sys was very high this time. Oy Vey! The late call to the Porcelain Throne arrived. Off to the wetroom. All over in seconds and not so messy. But the accompanying HHPWW, I had to wait several moments for its starting, then it was all over in two seconds! I don’t know if this sudden c hange in the wees-wees is good or bad? Checked the pins and pictured them. A few more papsules and spider-veins and the knees looked a bit warped again. But I’m not complaining in the least. The fluid content had gone down very well. I’ve only just noticed, the left knee looked like part of a Dalek or a one-eyed alien from a film, comic or TV, but I can’t place which one . Hahaha! The only thing that caught me out was when I pulled up the jammie-bottoms and an annoying stinging pain emanated from the right ankle. I carried on cleaning up and went to the front room to take a close look, with the foot on the Ottoman. A very light red sort of, what’s the word, erm… swelling had appeared just above the ankle, above the new blood papsule. Boy, it stung! But I put some Germolene on it, and as long as I don’t catch it, I can’t feel it. The mysteries continue! It’ll be fun when I have to put the sock back on! Another very short HHPWW was taken. Then I got the clothes stored away that I had left in the bag in the hallway yesterday when I had my funny turn. I made a brew and got on the computer, to update Saturday’s post. It turned out to be a long job, with my not doing any much, yesterday. Got it sent off. Made a start on this blog, up to here, and the craving for a mug of strong flavoured tea and some brekkers tool a grip of me. I decided I enjoyed yesterdays Marmite breakfast so much, I’d have the same again today. And jolly-nice it was with the Glengettie cuppa, too! I remembered that the Winwood Tenants Association meeting is today. I’ll go along, but don’t expect to hear enough to make any valid contributions. Made up a Morrison order for next week. All done. I had ordered it for Wednesday of course. Cause of the doctor’s making appointments for me for the next two Thursdays, which ruins my chances of getting to Social hour. But it doesn’t bother me! Lie-Mode Engaged! Got the ablutions done and readied myself for the hobble to the Nottingham City Homes, Winwood Heights, Hauptbereitschaftsleiteress Warden’s Temporary HQ. Sarcasm & Insult distribution area. Tenants Socialisationistical Meeting Shed. Telling Inchcock off Zone. Where things like crockery and pottery get stolen from, Rumourmongering Clinic, and somewhere to rest while waiting for the bus, Portakabin shed, to the Tenants meeting. I did health checks and medication taking. Hobbled along Chestnut Walk to the cabin, to find it well-filled with free food eating tenants. I only knew three of the thirty or so that was in there. Then I suffered a dizzy attack, and voices and my concentration got all jumbled. The cacophony of voices meant hearing and understanding what was being said and identifying who was who was too complicated for me. I decided to stay a while and had a chat with Bill, and handed out some of the coconut chocolate wheels, then made my way out and back to the flat. I took some photographs of how the flats and the new building was coming along as I walked back. I got in the flat, feeling a little disappointed with how things went at the meet. Possibly and most likely because I was not entirely with-it, due to the ankle and Dizzy Dennis’s visit. Then I did the health checks and medication taking. I got a super nosh prepared, too much of it again. Tsk! But enjoyed what I did eat of it. Then I fell asleep for about two hours with the tray and accoutrements and uneaten fodder on it, and it was in the self-same position when I woke up in need of a wee-wee! Regrettably, Little Inchies Lesion had been bleeding badly and left me in a messy condition, that needed cleaning up, a change of clothes and medicationalisationing. Humph! Afterwards, I thought I’d watch a Heartbeat DVD. Inchcock Today – Saturday/Sunday 5th/6th May 2018; A disaffectionate couple of days, Tsk! 0120hrs: A terrible night for not being able to get to sleep. Gave-up and got-up. Had a wee-wee. Then collated the second bag of washing and accoutrements, and down to the laundry room. Set the washer going and back up to the apartment. Made a small mug of tea and started to do the Health Checks. For some unknown to me reason, the sphygmomanometer took me four attempts at starting it before it gave the readings. Kept coming up EE for error. I knew the batteries were not old? Blimus! The readings had changed this morning! But, thinking about it, I had been up and down a bit with doing the laundry. So this may have affected them. 0158hrs: Down to swap the clothing from the washer to the dryer. The filter had not been cleaned. Up again to the flat, set the timer to remind me about the laundry drying being done and got on with sorting the photographs for the diaries. Made a start, up to here in this diary, then I went on to finalise yesterday’s blog. But ran out of time, as the alarm reminder chirped into life to tell me the drying clothes should be ready for collection. So, another wee-wee and down in the lift again, and collected the laundry from the dryer. I pooped… Hahaha! I left this typo-error in, what a comical one! : I popped outside to see how the weather was and found it war with no wind, rain or mist. We are are going to have a spell of hot weather methinks, for the holiday weekend. I checked on the web later. It said the hottest Bank Holiday Monday for donkey’s years is on its way. Not that I will be going far with no bus service for the flats for two days. Got back in the apartment, and stored the cleaned togs away. Had a wee-wee and made another small mug of tea, as the last one, I let go cold. Tsk! Then I finally got around to updating the Friday post. Onto CorelDraw/Paint to get some urgently needed diary top graphics done. Six hours later now, and only three done, but they are decent ones, I think. Made a brew, had a wee-wee and went on the WordPress Reader. Got the potatoes in the oven. Feeling tired now, and a bit low, I don’t like holiday weekends and having no buses servicing the flats for two days. I sat listening to Herbert’s clattering about, while I waited for the potatoes to be baked. Removed the spuds from the oven, cut them in halves and took out the flesh from the husks, into a bowl and mashed them up with some extra-strong cheddar cheese and onion salt with vinegar. Flesh replaced into the skins, and forked the top of them, to help get a crispy burnt top. Mmm! Back in the oven and set the timer. Back to the recliner and boy, did the mind ramble and fret, then. I allowed myself to get feeling pitiably sorry for myself, angry at injustices, hatred for the way the world was losing any sense of morality and my being stuck indoors for three days. A message came through, asking for help. No idea what with, but I knew the names and rang the number given. Luckily it was okay and not a con. The person is coming to see me on Tuesday, with hopes from him and me, that I can give some aid with his problem. This delay meant the moment I rang off off the phone, I could smell the burning potatoes. As it turned out, they were burnt spot-on how I like them. Phew! A great flavoured, 9.45/10 rated meal! With the cheesy roast spuds being relished as I gobbled them up. Ate the lot, everything. Not a crumb left on the plate. I felt very content inside as I went off to utilise the Porcelain Throne. As I was leaving the wet room after washing up, Dizzy Dennis paid me a violent visit. This proved to be one of worst he has ever affected me. I didn’t go over, but this was I think, due to the fact, that I sat down and stayed down and did the breathing thing. This was the end of my active day. I remained in that chair, the mind in a muddle all night long, getting some sleep in hours later, but only about three hours worth. Better day of the two, by far! Around 0330hrs, I woke with a start, with bits of a dream apparently in my head. I immediately scribbled some notes on the pad to use later, while the recollections were obtainable before they evaporated into the ether. The brain eventually interfaced grudgingly with the body (in a fashion), with a certain inertia. As I positioned myself for escaping from the £300 second-hand recliner, I prayed that the adiaphorous Dizzy Dennis would not return again, this morning. Getting to my feet, I was temporarily gladdened to find no indications of dizziness as I carefully (Obviously not careful enough) walked into the kitchen to do the Health Checks. Unfortunately, I stubbed a toe on the shelving units on the way there. Huh! I must try to get out today for a hobble: I might go to the Woodthorpe Grange Tropical House. This may help the blood flow and make the chances of another attack from Dizzy Dennis less likely? Got the kettle on, and sorted the Health Check paraphernalia out. The hemadynamometer took three tries to get it to work. The resultant readings seemed well within range again today. Off to the Porcelain Throne. No drama, hassle, bleeding or pain was involved in this evacuation. Washed the pots from last nights nosh. Got the computer on to update this diary. I consulted the notes I’d made for last nights dream as I made the top graphic. I started off in the old control room where I last worked, with the foyer for the flats on the monitor. The fact that it was many years after I was in the Control Room before being made superfluous before I knew of these flats, everything seemed to me to be normal. Seeing the ghost or spirit on the screen, I put my hand through the monitor to try and grab it? – Next thing, I was in my apartment looking at the TV and the old control office? – Then, this ghost appeared in the room, an old lady who spoke! She told me that embroidery (Or needlework, something like this) is very relaxing? – Next, I was back in the old control room, and it was full of ghosts milling about, but no one else could see them… Very odd! Went to make another small mug of tea, and off went the grey-cell holding box, fretting, fearing, worrying, anticipating and predicting. The need for a wee-wee helped me to reign in its meanderings. Especially when things needing cleaning up and the anti-bleed Daktacort cream applying. 0415hrs: Back to the computer and made a start on this Sunday bit of the post. Off for another wee-wee. Huh! 0630hrs: I took this photo with the old small Nokia from the kitchen window. It shows the Nottingham City Hospital in the background. I loaded it into CorelDraw and saved it as 32bit instead of 24bit format, and it came out a lot clearer than usual. The stomach, has started grumbling and rumbling a bit? Went on to the WordPress Reader page. No comments had come in, so none to reply too (See how quick I worked that one out? Hehe!). Off to the ablutionisationing session. All went well, no cuts shaving, Harold’s Haemorrhoids not bleeding, and Inchies lesion easier to clean and medicate this time. The shower head needs looking at, blocking up a little. Got the waste bags sorted and took them with me and dropped them off at the chute, as I left. The usual grubbing about to make sure I’d got everything needed before I left the flat, and checked things were not left on or off that shouldn’t be; like lights, power sockets, cooker and taps. And off I trundled. I hobbled around the back of the apartment buildings and took two photographs of the current condition they are in. I shot the second one so you could see the new buildings progress, for the 44 Extra Care flats and the Wehrmacht Wardens offices and HQ. Oh, and the rooftop seating. The weather was sunshine with little wind. But of course I could not take advantage of the sun, and wisely I kept the skin covered up. Still enjoyed the walk, though. My neighbour was playing football with one of his grandkids at the dead end of Chestnut Walk, near the cut-through onto Woodthorpe Grange Park. We exchanged greetings, and I made my way up the beaten path and into the field. I found myself treading with care to avoid standing on the most glorious to me, new Spring flowers in the sunshine. As I made the way up the hill, I decided to walk there and back under the trees and through to the topiary growth area, via the paths available. To afford me some little protection from the full blare of the sunshine. It really was a most pleasant limp-along. I could just hear some shouting, and it took me a while to locate where it was coming from. I was surprised that I could hear it, for it was emanating from way-away at the top over the footpath on the football pitch. A ladies football team train and play on this ground, and whoever the bloke with the voluminous voice, he was giving some vocals. Hehe! I pressed on savouring the peace, enjoying seeing the others enjoying themselves and I felt a little elated for some reason? As I walked through the last bit of tended garden area before the entrance to the Garden Shop and Tropical Garden, I thought I could smell Bdellium in the air? Now there is something! I could remember the smell, but not the name, I had to look that up. Many years ago when I was at night school, training for my Grocers Institute Award, some Bdellium was brought into the meeting hall as part of the course, and I have never it seems, forgotten the beautiful aroma from it. I think it used to be used in making soap products and fresheners? Again, as I recall, the tutor said it came from Myyrh trees. I didn’t know these grew in this country, do they? Whatever it was, it reminded me strongly of smell, then, anyway. I don’t know why I bothered saying all that – it’s not earth-shattering, essential or imperative news, is it? Hahaha! I went around the flower oval, up the hill and into the Garden Centre. There were many thousands of seedlings if that is the word?) all over, in any free space they had, including the front of the Tropical House, as well as the many large glasshouses all being in use for this job. I notice some delicate white flowered little plants and fell in love with them straight away. They were Commelinaceae, of course. The proper name of Tradescantia Fluminensis, from South America, everyone knows this. Even I did as soon as I read the card stuck in the soil. Hehehe! No idea why I took a shine to these in particular? Two ladies and a young boy were the only other visitors with me in there. The lad nearly fell into the goldfish pond! Bless him! He was not in the least fazed by this, but his Mother was! I tried to take a photo of the fish that included a brown carp, but it didn’t come out too well I’m afraid. Then I saw these red-flowered plants that were growing alongside the edge of the pond. Unfortunately, there was no interpretive sign near them to identify them with. Rare but beautiful! The heat in there forced me to leave before I’d had a proper look around. Not that I minded, for it leaves me with the option of a return visit when there are no buses available again later in the month. As I hobbled through the unkempt park of the layout, which incidentally is my favourite bit of the park, I could hear the barking voice again. It came from the football pitch in the distance. Off course, I couldn’t make out what the chap was shouting, but was amazed I could hear the man’s voice from so far away. A few yards further down the hill, and, got that smell of the Bdellium in my nostrils again. I got underneath an ancient warped, deformed tree, thinking this was where the scent came from, but no, it wasn’t. I never smelt it again anywhere on the walk home. I took out the hearing aids, and the stroll seemed more peaceful than ever. I took a belated zoomed-in shot of the old Manor House, now Nottingham City Council’s offices. About 2/3rds of the way back when and Sister Jane rang on the mobile. Amazingly it was clear to listen to, and I only had to asked her what she said about four times. I got in the lift and was listening to Jane telling me off about something or other, oh, no, I tell a fib, she was saying how she and Pete went out the other night into town, wining and dining I think. Anyway, I stood there in the elevator harkening to her, and it dawned on me, this lift is taking a long time… then the door opened, and a lady got in. I realised then, it was still on the ground floor and I had not pressed the button for the 12th floor! What a shlemiel. Hehe! Said our cheerios, and got in the flat, straight to the wet room for a wee-wee. Got the oven warming to use later for the chips. I’d decided on oven chips, canned pork knuckle and tomatoes for the nosh. Computer turned on and spent three hours updating this diary up to here. Went to make another small mug of tea, and noticed a young couple taking advantage of the excellent weather, just below the bottom of the tree copse. Right on the mowed footway. Ah, memories! I used the Lumix and tried a really zoomed-in shot after taking the normal one. I think there is a way of setting it up to use the macro, (Not sure what this means, but I believe it is for close-up shots) which may or not, have produced a better zoomed shot? But, this fact is irrelevant, cause I can’t work out how to find the option to use it anyway. What a sad Schlump I be! Had a go on the WordPress Reader section. I was feeling well stonkered and exhausted suddenly. So sorted the nosh and tucked into it, an excellent one it was, too. Bit of clanging about from Herbert up above, but it was only for a short time. Again sleep was reluctant to come, so I put on the Heartbeat DVD. Got a few minutes into the episode, and had to get off to the wet room to tend to the fungal lesion that had started to leak blood. I got it stopped with surprising ease this time. Back to get the head down again. Eventually achieving the blissful state of sleep mode! Inchcock Today – Wednesday 9.3.16: Persistent Rain kept me indoors today! I woke at around 0400hrs and visited the porcelain. Good news, Little Inchy was not and had not been bleeding at all – but the haemorrhoids were leaking badly. However, Anne Gyna and Arthur Itis were such a lot easier this morning; Roger Reflux was not any better, but still, a good feeling the hassle being less than of recent. And, dare I say it? No dizzies lately, Ace that! Made a good strong cup of Yorkshire tea and took my medications. The rain was, as forecast, must have been pouring down all night, and still coming, fine raindrops but persistent like.I opened the window because the rain was falling away from the flats at this stage, and Chestnut Walk below looked more like a river! I opened the window because the rain was falling away from the flats at this point, and Chestnut Walk below looked more like a river! I got on the laptop and finished Tuesday’s Dairy, then started this one to here. A day indoors methinks today. I mused on maybe being able to get the laundry done, but of course, all the other tenants without transport will possibly be doing the same and hibernating for the day so they will be after the laundry room as well? Watched the Leeds v Colchester Cup Match from 1972 on YouTube. I did enjoy that, not as much as when I watched at the time mind. Had a nibble, some biscuits and a bit of Honey BBQ Beef Jerky. The rain was continuing to fall outside. I put some clothes in the bowl to soak and realised the difference between the size of detergent I thought I’d ordered, and size I received. Got the din dins cooking. Largish potato baking, with a minted lamb chop, mini-tin of garden peas and beetroot to add. Lamb not cooked, so took the potato out and gave the lamb some more time. I did ring Sister Jane to ask how long to give the chop, she rang back while I was taking out the potato. We managed a little natter, that was cut short my need for the porcelain. No bread was consumed with this nosh! She suggested I put the alarm on so as not to let the chop burn, goos idea, so I did. Got it all on a smaller plate, not eating so much cause I had that naughty nibble earlier. I must try to get some more of the large baking spuds next time I’m out and about. I used the plate sent to me from America by cherished TFZ site Cyber-Friend, Lucious Lyzzi. I’ve still got some Minted Lamb left, three small pieces that I might have tomorrow with some flavoured baked beans and soda bread? Cleaned the pots and then it came; the dizzies! The next four hours were not very nice. Stopped using the laptop and even watching the TV made it worse. Tried reading my book, a definite no-no that! Around 2200hrs, I nipped to the throne and the dizzies dissipated afterwards, thank heavens. I put the TV on (A bit late, for me like), and fell asleep during the first commercial break… Zzz! Inchcock Today Fri 29 Jan 2016: Housebound Again. Huh! How does an insomnia affected solicitor get to sleep? He does nothing different; he lies on one side, and then lies on the other. While covering himself of course! Managed to get some kip in, a good straight five hours, at last! The howling winds made sure I didn’t nod off again. They were so loud, even without my hearing aids in. Made a cuppa, took the medications and got the laptop booted. Waited while the Windows updates were installed. Read a bit of my book, whistled, had a search for the still missing lottery ticket, went to the porcelain; No bleeding at all this morning. Not surprising really, this event reminded me of the Warfarin Blood Level results being so low. Made another cuppa, and the Windows updates had finished at last. So I checked the email, to see if they had sent me instructions for the Enoxaparin injections. Nothing in yet. Did a post on WordPress with a gallery of the TFZers English Country Garden graphics on it. Blimey this wind up here is getting noisier and noisier. I feel sorry for the tenants with decent hearing. It’s blowing into the kitchen from the holes in the wall behind the cabinets something awful! The drawers and doors are opening on their own; the wind is that strong! I hope it calms down soon, I don’t fancy having to go out in this howling gale at all. I’ll have to take a bagful of tinned food with me to stop me getting blown away. I thought of a funny at this stage. So I got Coreldraw opened and created this little bit of fun about the howling winds outside the block of flats. Took me an hour or four to get it something like. I think I’m addicted. Hehe! I checked the emails to see if the surgery had sent me an appointment for my enoxaparin injections. Apparently I’m at risk of DVT prophylaxis, whatever that is, I’ll have to look it up. letJust before I logged off to have me shave with a razor and bath, I checked the emails again – good job too. The Surgery had sent me an email telling me, my appointment for the INR test was due yesterday! Which of course I had done. They added another message, good job I scrolled down. It is for Monday the 1st February. Not going out in these winds today thank you very much. When I’ve had me bath and ablutions, I’ll get the medication pots done up. Did you see that? Did you? I made a decision! Hehe! No, no, changed my mind again. Tsk! I’m to do the tablets first. Note the number of empty boxes and foil from the distributed medications? And, how good I was not to make a mess either eh? Awards and prizes for me being a good boy will be gratefully accepted. I fang you. Hehe! Then I had an enjoyable bath and scrub-up. Thought I felt the stomach rumbling again… Yes, there she goes. Then I had a dizzy spell, the first time in 5-6 days. Humph! Ah well, at least, the constipations finished. I thought I’d been doing okay lately too. Thu 23 July 2015: Fire alarm, Smoke Alarm and Lift Broke. 00540hrs: Woke and dashed to the porcelain yet again. Stayed up and finished yesterdays dairy, then went on Facebook for ages. Laptop on and got carried away doing some graphics using Coreldraw x7 and Corelpaint. A pot of porridge and many cups of tea later, I got it posted on Facebook. Toyed with the other camera to try to work out how to get panorama piccies took – gave up and did a straight one from the balcony, it’s at the top of this diary. Very late with me medications as I got carried away with graphicalisationing. Mucho wet rain forecast on radio Nottingham. Had a S, S, & S – well, not the shampoo. Hehe!. GP receptionist rang with the INR blood test results – too high again, they gave me the new dosages over the phone. Went down and did me laundry – got there and realised I’d not taken me 20p’s for the machines – Tsk! Back up and got them. Wot plonka! Met Norman from flat 76 on the same floor as me in the lobby. Had a nice chin-wag with him. We have a lot in common – mainly our abilities to fall over! Got the laundry done and back up to the flat. Within the hour the maintenance man called to look at the hole in the wall near the vent – said it needed bricking up. So that means the decorating I’ve just had done will need doing again afterwards – and as they are going to replace the kitchen window later as well – I might have to wait until that’s done too before cleaning up after the first session, and the second session is likely to be many weeks after the first and then later they will be replacing the bath with a disabled type one so I can get in and out easier without risking life and limb, then they plan to… oh and the old dump needs… Oh never mind. Back to the repair man and the vent with a giant hole in the wall causing the draughts: The man felt the draughts coming in and got on his phone and arranged for someone to come and brick-up the hole. Thursday 30th July 0930 to 1400hrs. It’s driving missen potty here thinking about things. Huh!. The INR test results arrived at the flat – so they have got me new address at last on the system. Deana and the other woman arrived at the door for Deana to replace me Wrist alarm alert thingamajig. Please note how straight the index finger is in this photographicalisation wot I done. A much much better day with Arthur Itis not bothering me fingers at almost at all – mind you, he was showing some interest in me knees. We had a laugh and I told her about the window and air-vent plans. A lady in the flats has a writing bureau to give away and asked me if I was interested and I said yes, but until I get me carpets in I have no way of storing it without having to keep moving it when the carpet layers arrive. Shame! Deana said she would be in on Tuesday when the carpet man arrives and to call her when he arrives and she’s come and have a talk with him. Steve from Age UK phones, oblivious to the fact I’d tried to contact him repeatedly over the passed 6 days. He says when the carpet is fitted, contact him and arrange to meet him at the old place to have a look at hat needs sorting. Did some Facebooking for a good while, then made me nosh. Polish chicken, chips, petits-pois, beetroot and smoked mini-sausages. A kindly neighbour called to tell me the lifts were now back working. I didn’t realise they had stopped working? Took me medications and sat for hours thinking about things that needed to be done, how to get them done, things I can’t manage to do, where to get the help from, will I live long enough to get the old place and the flat sorted, will I run out of money before I sell the old place… does it matter? Got me quilt on the kitchen floor, laid down and read me book for a while, amazing how despite all the confusion in me brain I could concentrate on it, but I did? Until the draughts coming in got worse, then that brought the negatives back to mind… Do I need a shrink? – Hehe! Wed 8 July 2015: Inchcock Today – Amazing discovery! I was on a plane with several other people, none that I recognised. The seats were toilets… and we were singing and smiling at each other, when a door opened and a smiling pilot with a giant bottle of oxygen on a trolley came into the cabin and started to spray us all with it? That’s all I recall, but better than nowt. Got up an WC’d… bleeding from the little Inch again – Tsk! and put the hot water heater on. Did a search for me paint-splattered clothes, made up a laundry carrier bag to use until I get a basket later sometime. Went into the bathroom for a wash and shave, felt better then – despite having to clean off paint splashes from the taps, bath, floor and WC. Tsk! Made a cuppa and took me medications. Laptop on to start the diary. Bit nippy this morning so put me dressing gown on above me other togs. Brrr! Glendora is calling today, no idea what time, just hope she doesn’t come when I’m at the clinic. I must say I’m liking this Virgin internet connection up to now. It’s faster than BT broadband. I’ll try to get Glendora to phone about me gas and electricity at the old place for me, just to get the gas cut-off. I really must get the washing done down in the tiny laundry room before Glendora might come. Don’t want to do it too early in case the noise of the machines and water pipes bothers anyone sleeping late. Oh dear, just had a little dizzy spell then. Huh! Hey-ho, there are plenty of folk worse off than I am. Go me bit of washing ready, soap capsules, fabric conditioner and crossword book and pne… as I went through the door into the passageway – I heard the Fire Alarm sounding – unsure of how long it had been sounding I proceeded with me washing to walk down the stairs, and met a bloke coming up the stairs. He said it went off 15 minutes ago, and the Fire Brigade had said it was safe to re-enter. Oh dear? Proceeded down to laundry room and got the washing machine going without too much kerfuffle. Then started the drier and it said it took 60 minutes to dry, so went into the lobby with me crossword book, but I’d not got me reading glasses so that was the end of that idea. The bruising on me wrist from Monday is going down nicely – Tst! Glendora arrived ten minutes before the drier was due to finish. We went up to the flat. But I had not got the paperwork for her to sort out me Council tax or utility things – must get them for next Wednesday from the the old place when she comes again. She did ring Tesco to complain about me broken clock and crushed cake for me and they said they would knock off the costs against a later delivery. I nipped down and retrieved me well dried laundry from the drier and returned to the flat. Then I returned to the flat, having a little natter with some residents from the same floor near the lift, and made up me medication list and emailed it off to her. Then the Amazing Discovery was discovered… I found an area of at least two foot by 6 inches in the living room without any paint splashes on it! I wanted to get back to the flea-pit but by the time I’d had me visitor and sorted the fire-alarm concern time had beaten me. The buses will stop running to the flats in two hours so I would not be able to get back in time. Did a post for the LOMM site. Made list of medications and emailed it to Deana. Dizzy spell and I felt unwell. Ten minutes later the GP surgery rang – I’ve got to go in to have an emergency INR level blood test tomorrow for some reason the level has risen to 6.9! No wonder I was feeling cold with me blood that thin – Tsk! Take no Warfarin tonight! I had to start the laptop to check me appointments, and there are plenty of them this week. Now I have to hope that Caretaker Robert who is going to connect me cooker and the repairmen who are to do the kitchen repairs are on time so I can get to the GP surgery in time. I gave up trying to get some sleep and carried on with this diary, made a cuppa and cried with frustration! Getting dark early tonight – rain maybe coming. Took me medications, making sure I’d thrown away the Warfarin tablets from the pot first. Still feeling so tired and drained. The shoulder wound was really stinging this morning. Might have overdone the sorting yesterday, took an extra painkiller with me morning cuppa and medications. Couldn’t find the camera so I could finish yesterdays diary with the photo I took of me nosh. Searched all over – fearing I’d somehow threw it out with the unwanted rubbish. Looked in the bins stretched to get down and started the cancer wound off stinging again (Tsk! ), not there. Looked in me black bags, not there. An hour later I found it where I first looked for it! Fool! I’d put it back in its karki wallet and was looking for the black camera in me search! Hey-ho. Got the diary finished and did some Facebooking. Did some sorting – slowly, the shoulder still hurting badly for some reason since the nurse changed the dressing? 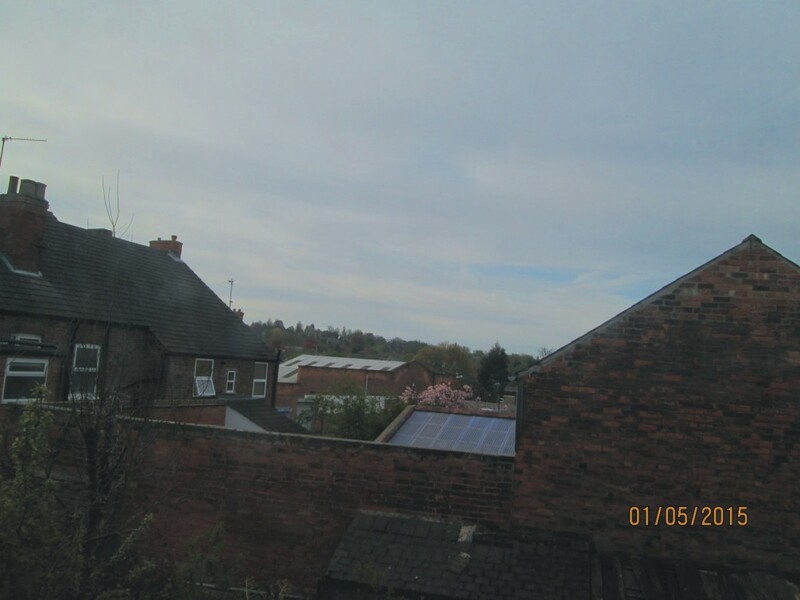 I went back on the laptop and searched City Homes eventually finding confirmation of my being accepted for the flat at Woodthorpe Court. Feel a bit better now. Still coughing and a-wheezing mind. Set to sorting, bit of shredding and then felt suddenly had a nasty dizzy-spell, felt drained beyond belief. Just had to get me head down. Woke at 0530hrs, Porcelain visitation a lot easier this morning. In the dreams I’d had, one about Patti Berkert I could remember bits of: Patti, Lynton and I were in a giant teepee – Patti wearing exotic native Indian head-wear telling me off for something or other, Lynton kept hitting me with a purple coloured bamboo cane whenever I spoke… inside with us were a giant typewriter, an artists easel and a Monopoly game? That’s all I can recollect. But it gave an the idea for a graphic for Patti. Which I managed to get done later and posted this off to Facebook and Patti. Down, laptop on, made a cuppa, fed the pigeons and took me morning medications and changed me dressing, managing with ultimate ease to bang missen on the head on the corner of the cupboard door – I believe I might have swore! Oh poetry! Started this diary off and did header in Coreldraw x7. Then I worked on something I’ve been planning for ages now – a graphicalisation of Patti Bekert in Native Indian clobber. This took three hours, up to now, but I really wanted to do it and hope cross-fingered that Patti likes it. I’ve put Lynton on this version being as he had the nerve to come into me dreams… Tsk! As I was finishing off the graphic making new pains shot across me chests – I don’t think it’s the angina this time. My reflux valve that is normally protruding has disappeared from view and feel as well, no lumpy extrusion? Just a sight or feel of any raised bits? Today I must go to the GP surgery to book me INR Warfarin blood level test with the surgery nurse, and take some nibbles to the Launderette gal. Thursday going to the hospital with Pete to have his skin cancer cut out and tested again. Friday it’s my turn to have the same at the same place. Friday I must also go to the City Homes and Guinness Homes in search of sheltered housing at a price I can afford. It’s the first time I’ve passed the St Johns graveyard during the day and found no dogs in it – thought I’d mention it like. Plodded on to the GP surgery where I asked the receptionist for an appointment early on Tuesday so I could keep me appointment with Steve from Age UK Concern about viewing the flats available. Nipped to the launderette and gave the gal her nibbles. Oh dear oh dear oh dear! No bus-pass in me pocket and the zip on the pocket was down! A quickish hobble back to the dump and search for it was fruitless! So, I walk into town was called for in an effort to see if it has been handed into the City Transport Travel centre, where I got it from in the first place. 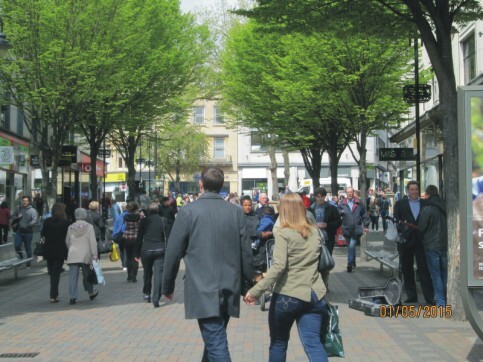 So off down Mansfield Road and through the City Centre and to South Parade where the centre is. A little further on, and this young git of a Nottingham Pavement Cyclist actually caught my left arm/shoulder as he belted by me! They keep coming don’t they! Tsk! I don’t think he even knew he’s done it as he just carried on threatening the other pedestrians as he disappeared into the distance. Down and across into Clinton Street and bravely through the milling crowds I continued on me quest. Down and around the back of the Nottingham Council House, and right onto South Parade and down to the City Transport offices to see if me bus-pass had been handed in and how to get a new one if not. It’s near the tram stop and Betfred bookies, just passed the pub. I went in and explained the situation to the lady, who took me details and checked to see if it had been handed in. It hadn’t – and I asked her if I should try the Transport Centre in Broadmarsh. She said “No point, they usually get handed in here, and we can do nothing about re-issuing you with one until 48 hours has passed from your losing it!” I explained that it was over 24 hours now – but she didn’t seem too interested and told me call back in a day. So I poddled down to Broadmarsh anyway, being stubborn and worried like. En route there was a five man street entertainment band giving out some jazz near Marks & Spencers. Had things not been so hectic and me worried about me bus-pass I might have donated a bit and stopped to listen to them. 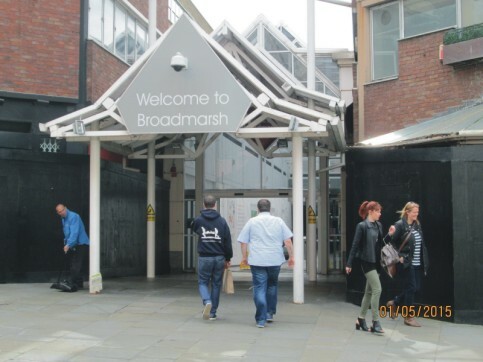 I got to Broadmarsh bus-station and into the Transport centre there. I explained things to the lady there – and she said there would be a £10 replacement charge if I needed one, and took me details and went to check. She has lovely smile on her face when she returned – with the Bus-Pass! Someone had handed it in – boy was I glad! Good job I didn’t take the advice from the other woman on South parade innit? Me feet and knees were hurting badly now – but somehow I didn’t mind. 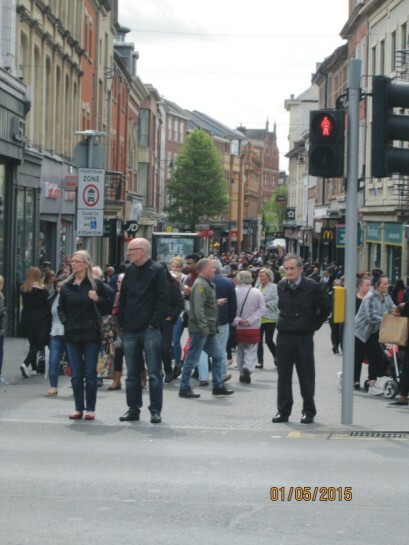 I limped back through to the City Centre slab square and waited for a tram so I could go to Bulwell to see if they had any cheapo microwave sausages in stock yet. I was going to take photo of a family playing in the fountains. 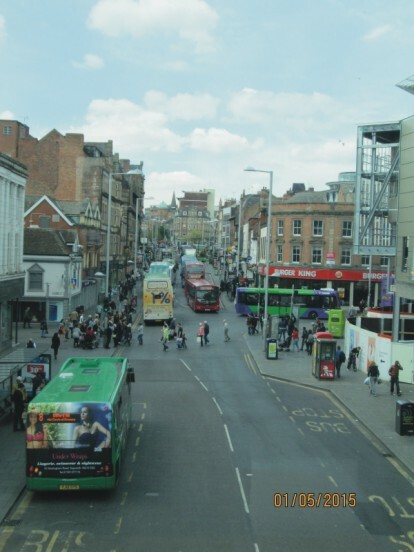 But being as another Nottingham Pavement Cyclist came into view, I took her instead. Swiped me treasured Bus-pass on the machine and waited the arrival of the tram. Not never seen owt like it when it arrived – I nearly got mangled in the flood of aggressive passengers storming it to get on! Cor blimey, talk about risky business! I got into Bulwell and visited some shops that might have had the sausages in stock that I wanted, but no. I took a Bling photo for the folk on TFZ. Then back to the bus station and caught the bus home to Carrington. A few yobs lurking now the better weather is here. Tsk! WC’d made a cuppa, and marinated me baked beans with Patti’s curried bean additions ready for me nosh of beans and bacon later. Updated me Google diary with the appointments I’d made during the day. Then updated this ‘ere diary. Aching legs and feet, but so happy to and grateful to whoever handed in me bus-pass. Got up to make a cuppa and boy did I have a dizzy spell – alright now, but I must inform the nurse on Monday about the increase in severity and frequency of these. By gum I enjoyed me nosh tonight! 1 pinch curry powder – Worcestershire sauce – half teaspoon Unrefined brown sugar – black pepper – BBQ Tomato ketchup – sultanas – basil and caramelised red onion relish. Not bad at all. Rated it: 8/10. Mind you, the bacon was Gammon misshapes this time. Going upstairs had a dizzy at the top and I went over. All okay though, banged me elbow that’s all. I’m hoping there will be no more Whoopsiedangleplops for a while now. Woke at 0730hrs with a jump – almost in a panic and didn’t know why? The sky looked daunting this morning. WC’d – no bleeding from the hemorrhoids, but the lesion in me Inch was dribbling blood and very tender and the boil was annoyed when I cleaned meself up and caught it! Took me temperature 31.1c – Forgot to do me BP tests – Tsk! Went down and made a flask of tea. Pulled the bins out for collection. Took me medications and applied me creams. 0745hrs: Laptop on and started this diary. Opened Coreldraw to do the header for it. 0834hrs Got the header done and on. Coreldraw9 froze on me and I had to start again – Huh! Did a bit of Facebooking then got myself spruced up and ready to go on a walk into Nottingham City Centre in search of some Bling’ photographs for the gals on the TFZ site. The weather had brightened up. Again some amazing patterns in the clouds this afternoon as I left the bomb-site. I called in the Co-op on me way and got some bread-Thins and Jam Doughnuts. 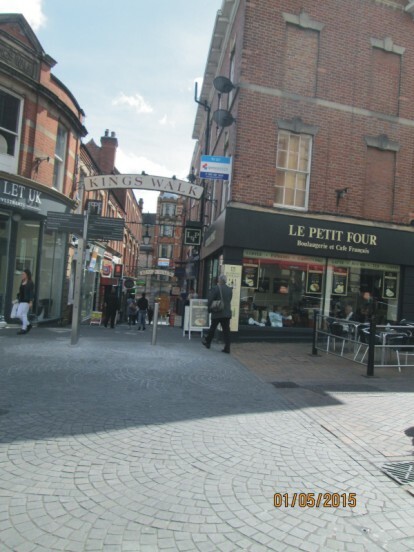 On me hobble into town I was nearly assaulted by various Nottingham Pavement Cyclists – it’s getting worse than ever now. This one with his back-pack was particularly dangerous due to the speed he was belting along at I thought. No sooner had I belatedly took a photo of the animal and a few hundred yards further on another one came belting passed me swerving all over the pavement en-route. Getting a tad nervous now as me ankles were worse, much worse than usual and my agility – such as it is, was much impeded. About half way up the hill and as I stopped to take a photo of the trees in the Rock cemetery from the other side of the road, I gave such a sneeze – and this shook even me – that one of me hearing-aids fell out. Painfully I bent down to retrieve it. 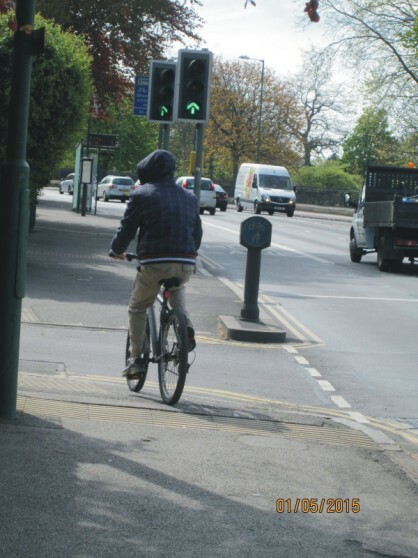 Then yet another Nottingham Pavement Cyclist came passed – I think this one just might have been a touch tiddly. 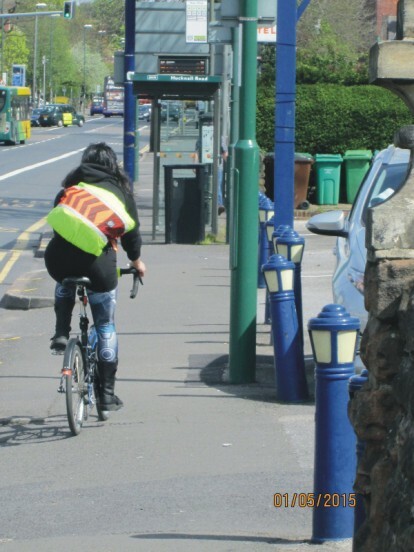 The immature yob-hoody lookalike who was obviously so tough he was too scared to cycle on the road was gong all over the place – a straight line was not in his vocabulary today. Maybe he thought he was on the road? Up to the top of the hill and down into town. 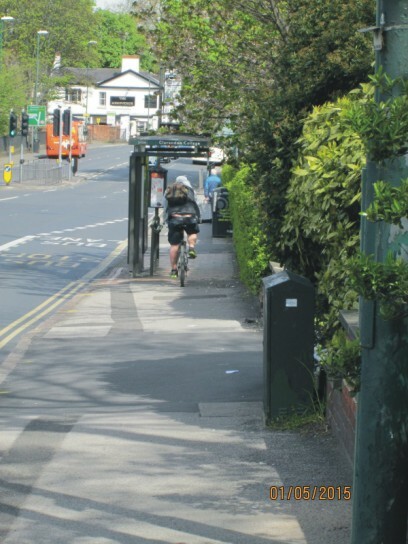 When I reached the junction with Woodborough road I kept me camera in me hand, a this is a regular spot for the inconsiderate unconcerned nonchalant nasty nihilistic Nottingham Pavement Cyclists to appear on me walks into town. 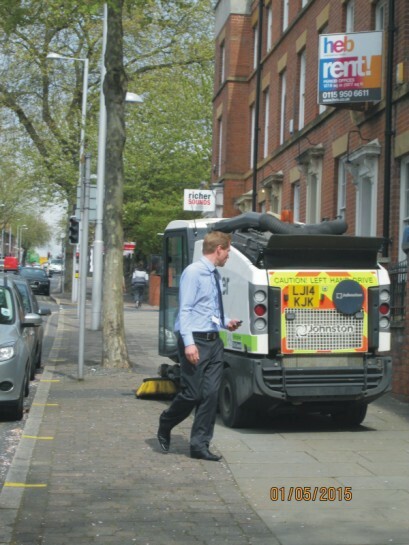 Today though it was one of the Councils electric powered mini-street-cleaners that nearly hit someone (Not me, the bloke in the picture – who was not pleased at all). I plodded down onto Milton Street and faced the prospect of getting through the maddening crowds on Clinton Street. I managed to get through unmolested to the back of the Council House. Slipped some seeds to the dicky-birds. As I passed some people on the Coffee Shop seating I realised that they were all drinking out of giant size mugs and didn’t seem to be enjoying the drinks really. I wondered if it was addictive qualities of coffee that make folk pay £3 a mug like and still not be happy? That started me reminiscing about the old days when around the corner from where I was, used to be a Cafe where coffee was four old pence and tea three old pence a cup and we enjoyed it? I was so deep in me memories that I nearly walked into a tree – luckily nowadays me rate of knots was slow I managed to avoid this at the last second. Huh! I crossed the road and went down Bridlesmith Gate. No street musicians, no Big Issue sellers and no yobs about in the area today – good that. I did notice a shop selling ladies shoes had a special offer on some of them… ‘Save 40% on the latest design footwear’ the sign indicated. On a closer inspection I saw the ladies could get a pair of crocodile high heel boots for only £299 in the Sale – £299? All the retail units that used to be their now closed down. 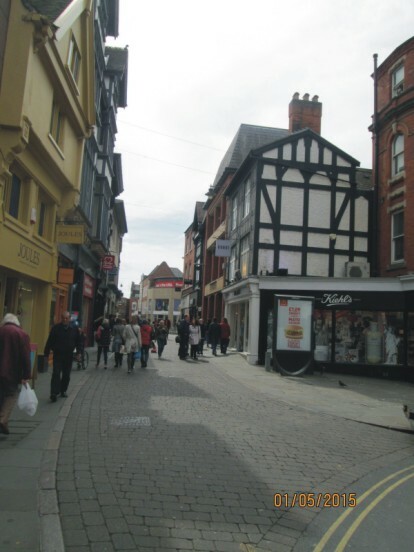 Worse still, the wonderful Drury Hill this medieval street was destroyed to make way for this doomed shopping mall – a crime if ever there was one by the Nottingham City Council the Banks and the nihilists in charge at the time! They should be brought back to life and flogged! I went in and had a look around the 99p shop. I got a microwave dish and some bikkies for the nurses amongst other bits. I walked down and through the pathetic centre. A stall was selling mobile phone accessories and I asked if they had any for the Nokia Lumia – he did at £9.99 – which was much better than the £25 they wanted at the EE shop, so I got one. Out the other end onto Wheeler Gate and up into the City Centre. 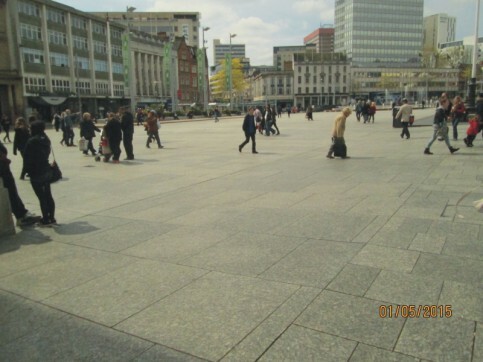 Plenty of street musicians and entertainers around this area – Muslims pushing the Koran and trying to convert peoples, Christians pushing the Bible and trying to convert people, Opinion surveyors stopping people (Mind you, they see me hobbling along and never seem to bother me?). Up through Exchange Walk and into the slab square. No CPOs around today – the cut-backs I suppose. 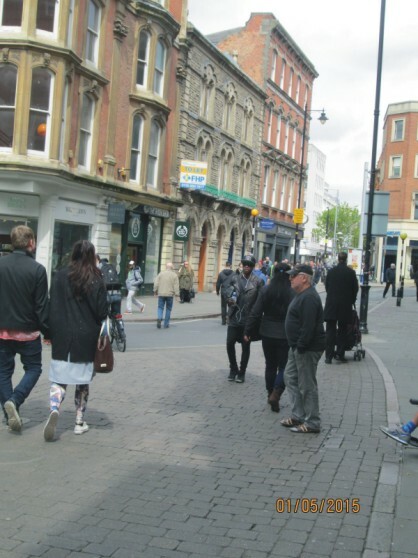 Around passed Primark and up Clumber Street – right and up onto the Walk-over to take a photograph from a different angle of the traffic. I say different, but nothing seems to stop the suicidal Nottinghamians from crossing the traffic lights against the signals. 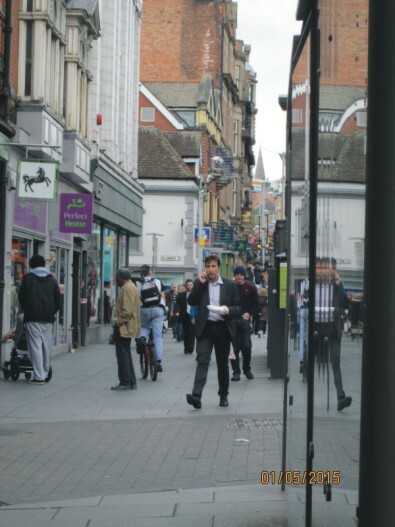 I carried on over into the Victoria Centre and had a gander around the market – gad it is so sad there nowadays. Closed stalls, un-fresh produce at high prices with owners who are likely to cut yer fingers off if you have the cheek to even look like your about to touch ‘Their’ fruit and veg on display, which is not the fruit or veg you get served with, they come from behind and under the counter of course. Another Nottingham Pavement Cyclist minging with pedestrians on Upper Parliament Street. I limped on in some discomfort now – the knees have join the ankles in a mutual effort to make Inchcock hurt. Hehehe! I went into Tesco – and what a mistaka -to-maka! I spent a small fortune. The Pork Loin, the Polish Chicken Sausages etc were all too tempting for me. So, along with the bread and doughnuts from the Co-op earlier, I’d got cooked sliced beetroot, Japanese Rice nibbles, Pork Loin, Chicken Sausages, New Potatoes in herbs and butter, Cox’s apples, tomatoes and a much lighter wallet. 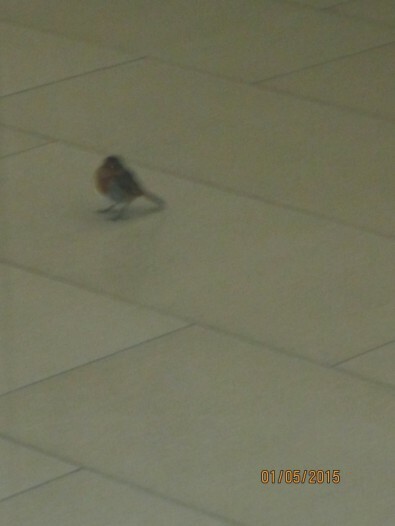 As I left the mall, I espied a single Robin in the centre. I hope it finds its way out safely? I departed and walked up to Trinity Square. There were many more fold about there today,but none of them seemed very happy. I took a photograph of some ‘Bling’ for the girls at the TFZ on Facebook during me walk today – Broad Marsh, Vic Centre and in Kings Walk. This one on the left was me favourite one. Pearls in reality as the girls on TFZ are also Pearls in reality. I poddled down and caught a bus back to Carrington. (Long live the Free Pensioners Bus-pass!). Got back and WC’d, applied some more cream on me lesion. Marvellous, and I watched a DVD ‘A good Day to Die Hard’ while I ate it – I bet the Queen didn’t? The Polish cooked chicken sausage was excellent. Woke up three hours later disorientated and wondering what time and day it was. Laptop on and updated this diary – during which a nasty dizzy spell visited me. Took me ages to get this done. Take care all and thanks fer reading. 29.4.15 Inchcock Today: Forgetful Fool! WC’d – I’m afraid the lesion on the Inch is still leaking. Applied some more cream. 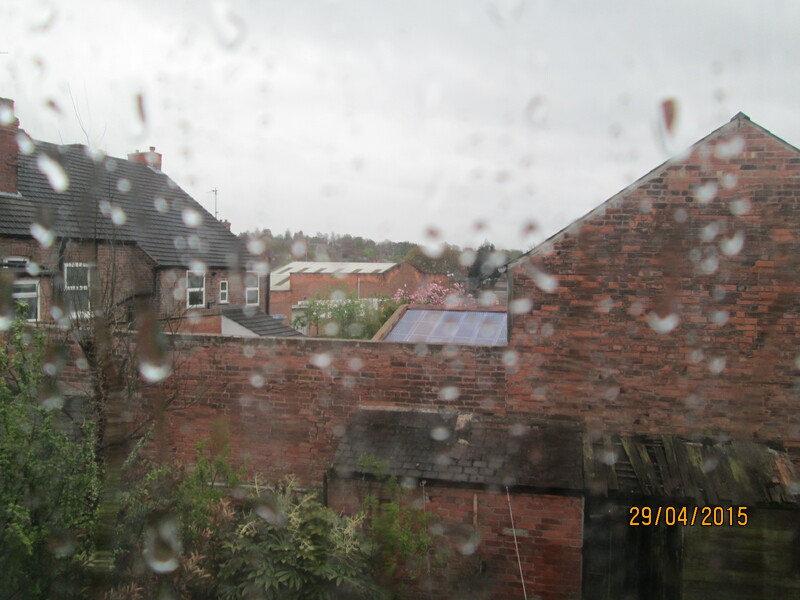 The rain was falling and it looked a bit drab outside – are we in for some snow later I wondered? Should I get out and get some food in today while it’s not as bad as it might be and is in some areas of the country? 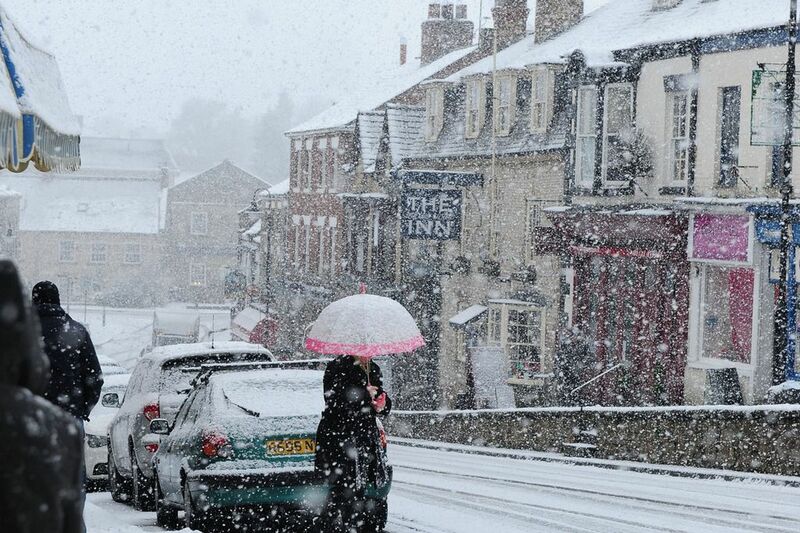 So glad that if it does come, it’s forecast for tomorrow to start here in Nottingham, local shops aren’t too far away. Regarding the bleeding Inch, the GUM clinic is a devil to get to. I think I’ll carry on using the cream I have in the hope that is clears it up so I don’t have to risk it going out in this weather – but the lesion seems larger than last time. Huh, Tsk and bother! Finished and posted yesterday’s Diary and spent a while trying to master Corel Paint Pro without much success. The rain had stopped and the beautiful clouds were milling about in the high winds just before I left to catch the bus into town – with the hope of getting some advice from the EE shop about the new mobile phone worra got from em yesterday. In the few minutes it took me to get to the bus-stop the clouds had turned a bit threatening. Minutes later the sky was bright once again? The only constant this morning was the wind. At the bus-stop managed to drop me bus-pass – you wouldn’t believe the problems I had trying to retrieve it from the floor – even I had to laugh. Caught the bus into the City Centre and walked down Milton Street and over the lights into Clinton Street. A police car with blues and twos on turned into the pedestrian area just before I did – I’m glad to say. There was a Street Musician playing a tiny banjo and I felt a bit sorry for him so dropped a bit in his hat. I called in the EE shop and asked a chap about locking the phone, and how to download pictures to the laptop – explaining that the other chap yesterday told me there was a lead in the box – there wasn’t. This chap explained it is part of the battery connector that has a plug both ends. I thanked him. Later when I got home I found this to be untrue, the lead is permanently fixed at the charger with no facility to remove it – Huh! I walked and caught a bus into Arnold. Straight to the Fultons shop and had a poddle about. They had some chilled lamb shanks in gravy that were microwaveable at only £2.99 for a box of two. Gonna have one of them tonight methinks. As I left the shop I narrowly missed being Whoopsidangleplopped by a Pavement Cyclist! Caught the bus back to Carrington and the asylum. Passing the Arnold Police Station I wondered if it was still operational. Couldn’t see any vehicles anywhere, no lights or bodies in sight anywhere at all. As we drove down Oxclose Lane the block of shops on the housing estate I noticed still only had one occupied and open. Two people seemed unscared enough to have left their vehicles outside too – maybe the owners are part of the local Mafia? A few hundred yards further on were two vehicles on the side-road that the drivers had intertwined with each other in a head-on crunch. Moment later the paramedic was arriving on scene. Clever how I managed to miss of the crashed cars in the photo – Tsk! Still bright but breezy weather. Dropped off at the Co-op store in Carrington to get some bread-thins. I noticed they have put up the price of Warburton Thins 6’s from £1 to £1.39 now… shame! They did have some Co-op label ones in eights that were smaller at £1 so I got a pack to try em out tonight. The twitchel (Definition: A slang word particular to the people of Nottingham meaning a path/alleyway/cut-through in a residential area) was free of anti-social elements so I cut through and back to the hovel, dropping a few seeds for Fatima and Fred. …. I’m back, sorry about that I got the cramps with me arthritis and a dizzy spell all at the same time then. Botherski! Took me medications while I waited fer me fingers to return to near normal – nearly dropped me tablets too. Hehe! Lamb shank in gravy, potatoes, garden peas, & Co-op Bread Thins. Followed by two iced lollies. Took me evening medications and applied me creams and lotions. Did some Facebooking and Blogging and created the header for today’s Diary. Soon felt tired, but could I nod off when I wanted to?